Before you start looking for your outdoor lighting, you need to determine what exactly you want from your lighting. You will need to consider the style of lighting, the area you want to light and your budget. 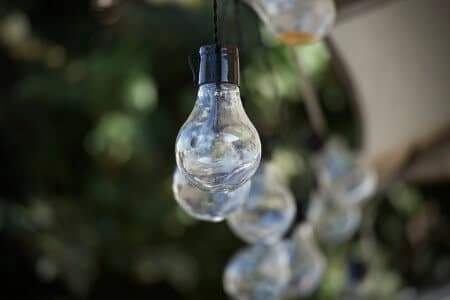 Hardwired lights have long been a popular choice, however these require installation by an electrician and have ongoing running costs. An increasingly popular alternative is outdoor solar lighting which is easier and cheaper to install. There is no single type of lighting that is considered best and both mains power and solar lighting have their own pros and cons. With this in mind, evaluate your needs. Where do you need light? How bright does it need to be? How long does it need to light for? Do you need to illuminate a large area or highlight a small area with a more focused beam? Is your lighting intended to highlight certain features? Is it for safety or security purposes? What is it’s primary purpose or task? What is your budget? If purchasing mains powered lighting include the electrical installation costs and globes in your budget. Feature lighting highlights objects such as ponds, walls, trees, shrubs, ornaments and fountains. Feature lights can be mounted in the ground or on walls and generally have a more subdued lighting level to help play with shadows and add drama. When planning your garden lighting, consider what you want to highlight and which areas may look especially dramatic at night. Low and architectural planting can appear impressive when illuminated with spotlights. Tall trees take on dramatic appearance when lit from below from a flood light. The larger arc of light captures the trunk and outer foliage allowing more play with light and shadow. 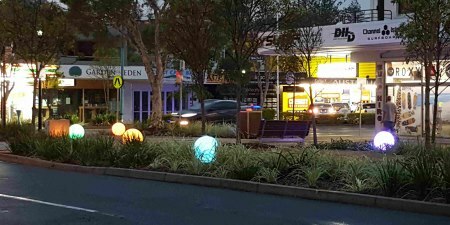 Coloured LED’s and globes add an additional dynamic mood and drama. You can also add a wash of light to feature garden walls or fences with spotlights or wall lights. Consider the amount of light required to illuminate the size of what you would like to feature. The most common form of lighting most people consider is safety lighting. These are lights that illuminate decks, gates, driveways, doorways, paths or stairs at night. This choice of lighting can be both functional and beautiful. FFloodlightsare a common choice for lighting decks and stairs. If you purchase a solar light with a separate solar panel, you have more options on mounting the light head under a roof or in a shaded position. Bollards are perfect for lighting pathways, driveways and gates. Bollards with 4 or more LEDs should provide adequate light for these areas. If lighting a public space, you will need to meet local regulations and lighting standards. Achieving sufficient illumination for purpose may be an undesirable source of light pollution to surrounding areas. In such instances, consider sensor lights that only turn on or become brighter as you approach, therefore minimizing any disturbances. Sensor lights also conserve power and, in the case of solar installations, this can equate to several nights operation from one day’s charge. Security lighting can assist in illuminating areas that have poor visibility or could potentially be hiding spots for intruders. Security experts agree that one of the best ways to protect a home or business from an intruder is to have adequate exterior lighting. Floodlights and motion sensor lights are the best choice for security lighting. If selecting mains powered flood lights, consider adding a timer so that they turn on and off automatically. If selecting a sensor light, remember the positioning of the light head and the sensor is vital to its success as a security light. Separate sensors will allow more flexibility in positioning. If selecting solar flood lights, ensure their designed operation time is a minimum of six-seven hours. Solar sensor lights should have a continuous run time of at least 3-4 hours. These lights are only activated when triggered by motion, so a long run time is not necessary. Lighting a space can be more than simply putting a light in here and there to provide illumination. Lighting can also help set the mood and contribute to the quality of your experience within the space. Taking this into consideration, good lighting design of an outdoor space involves balancing three different light sources: ambient, task and accent. Ambient light provides overall illumination to a space. This light source usually comes from above such as a centrally located ceiling mounted light. The light bounces off surrounding surfaces providing an even wash of illumination. The level of light is sufficient enough to navigate the space safely. Task lighting helps you perform certain tasks, such as reading, cooking or dining. Task lights are usually located next to the areas where these activities take place, directing light where it is needed most. Accent lights highlight points of interest such as garden ornaments, fountains and feature planting. They help create mood and drama.